One reason a dog can be such a comfort when you're feeling blue is that he doesn't try to find out why. Sarah Vowell wasn't the only guest to the city of Poughkeepsie. Bill Plympton made an appearance in fine form, and I was able to grab a souvenir. Enjoy! oh my god this is the stupidest slow motion meme ever. Love it! I love Sarah to death but that looks like a still from a horror movie. Po'Town shout out! Dems my peeps. I think it was here ocherdraco. I think this was the pic. Damnit, I took that photo! My first thought upon seeing that photo was "Why would anybody think Stephen Colbert was Matt Haughey in the first place?" Even a stopped meme is right twice every five years. 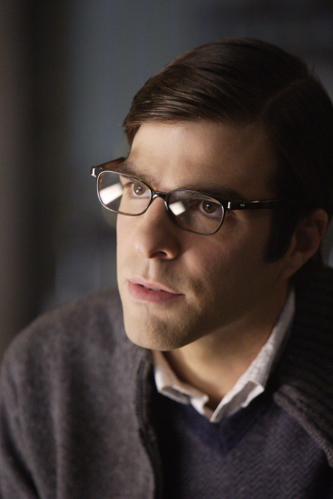 What you really need is a picture of Zachary Quinto holding that sign. Good on Ed, though. You know else wasn't Matt Haughey? That's right: Senator Dan Quayle. Other people who are not other people? adammathes, jessamyn. TOO BAD FOR HIM, says I. If Bill Plympton were Matt Haughey, my mind would be blown beyond repair. So thanks for clearing that up. Not Matt Haughey (or his baby). This, however, is Matt Haughey. You know, the guy from Meta Filler.com. Meta Filler.com would have been a good URL to aptly describe most of my contributions. 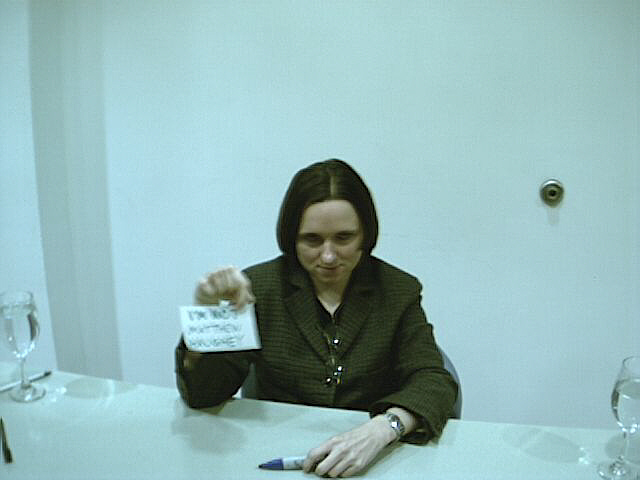 Wow Sarah Vowell looks demonic and quite unhappy to be holding up some sign up for a nerdy inside joke. That's the European date format. So, wait, jessamyn, were you actually on TDS? I really wish I had access to do the anti-version of this meme. How great would it be to get Quinto to do the menacing Sylar look with a sign that says "I AM Matt Haughey"? We could set up a gallery on the Wiki to document the memes run. I met Ed Helms very briefly at the Democratic National Convention 04, though one of the other people in our little blogger aerie did manage to get ridiculed by Samantha B on the tv. now we need mathowie to do his best imitation of Andy Bernard singing Country Roads or maybe something by Michael McDonald. So Matt Haughey is like the new hotness to Spartacus' old-and-bustedness? Relatively speaking, of course. So did John Hodgman actually regret taking that "I am not mathowie" pic or was he joking? He regretted it maybe a little because MATHOWIE WAS NOT THERE, but otherwise I don't think so. Yeah, immediately after I hit post I felt kind of stupid for essentially saying "Hay guys, was John Hodgman, noted humorist, joking?" What was mathowie doing in prison?